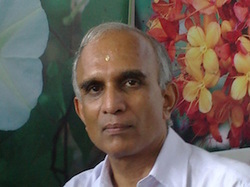 Dr. K. P. Muralidharan, Professor, PNNM Ayurveda College, Shornur, Kerala. ​"​What is this?​" is the most primitive question. To find it out we started finding out the ingredients that constitute the physical matter. We Found out the elements and studied chemical reactions. We understood atoms and subatomic particles and their functions. And we realized that this is a never ending process. We termed the non visible constituent of the matter as 'energy'. Energy is perceived by properties and functions of the matter. Energy indicated by property is the latent energy and energy indicated by function is the kinetic energy. The subtle most physical matter or physical entity that constitutes kinetic energy is considered to be space since Einstein, as we understood space to be matter bound. Is this space a physical matter? Yes. But it can be perceived only as a mathematical construct. The great physicist of 'Uncertainty Principle', Dr. Warner Heisenberg said it was not [completely] material object but, form, mathematical symmetry. What is the stuff that constitutes this mathematical symmetry? The same man of the 'theory of Observer Effect' again said it was an intellectual content, the logos. In this step, we see, the modern science transgresses the material or physical world to enter the metaphysical. The quantum revolutionary, Max Plank also said that a conscious intelligent mind which constitutes energy is the fundamental basis of all matter. On the brink of the deepest subtlety of the physical plane or in the threshold of the metaphysical plane, the space curves causing a twist in the spacial and temporal natures of the matter. Theories of Ayurveda are derived from Sankhya philosophy. It also says the physical phenomena evolves from the metaphysical plane. Ahamkara, the metaphysical ' I ' projects itself into three forms within itself, viz, Mind, Indriya [sense] and Tanmatras. The word tanmatra means constituent unit of the physical matter. Tanmatras are the knowledge of the basic objects of our five senses, viz, sound, touch, form/color, taste and smell. The sound tanmatra transforms into space [Akasha]. In this process it traverses from the metaphysical plane to the physical plane, assuming the above said twist. In the metaphysical plane, sound was the tanmatra's spacial nature. In the physical plane, sound is the temporal nature of space[Akasha]. In the same way tanmatras of touch, form, taste and smell transform into kinetic energy [Vayu], latent energy [Agni], cohesion [Jala] and solidity [Pr'thvi] respectively. Akasha transforms into Vayu and Vayu into Agni. These are in the subtle, energy level of the physical world. Then Agni evolves into Jala with a total twist transforming its properties to totally opposite ones. Now it has entered into the gross plane of the physical world . And Shastras say creation is by Jala. Jala transforms into Pr'thvi assuming solidity. When a physical matter or body disintegrates, the plane of Pr'thvi dissolves into that of Jala, plane of Jala into that of Agni, plane of Agni into that of Vayu, plane of Vayu into that of Akasha and plane of Akasha into that of Ahankara. According to Shastra a physical matter or body made of Pachabhutas [Akasha, Vayu etc.] has two constitutional planes of existence. Karana sharira [Prakr'ti - the causative primordial] constitutes Sukshma Sharira [PRAKR'TI, BUD”DHI and AHAMKARA together - the metaphysical] and Sukshma Sharira constitutes the Physical matter or body [Panchabhuta]. We have to say that the Physical Body; its absolute constituent,the SUKSHMA SHARIRA; and the sukshma sharira's absolute constituent, the KARANA SHARIRA; all these three remain in the same time and space [like the table and the atoms which constitute the table – This is called 'samavaya']! But defenitely each of the three has its own world. Thus the immediate constituent metaphysical plane of our body is Ahamkara. Here I am going to present Ayurvedic psychology and psychiatry in the background of the analysis and explanation of the said METAPHYSICAL PLANES.